We go for a evening boat ride by the sunset and witness the activities by the river side in the evening, watch the cremation at Manikarnika Ghat from the boat. Finally stop at Dasaswamedh Ghat to enjoy the Ganga Aarti ceremony from your private boat. 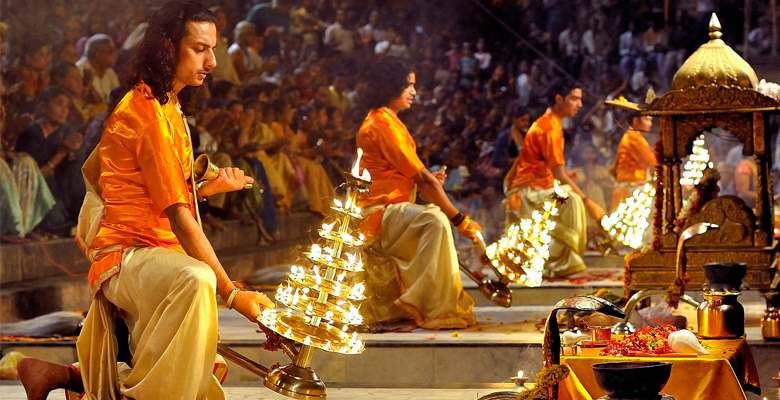 The aarti is performed on a stage by a group of young priests facing towards the river. It is a special ritual for the invocation of the River Ganga, which as per the sacred belief of the Hindus is a Mother Goddess.